How do I enter a promo/source code? Should any item fail to meet your expectations, simply return it within 90 days in a new and unused condition and we will gladly exchange it or refund your merchandise price. Shipping and processing charges are not refundable. 1) Fill out the Return/Exchange Form at the bottom of your invoice, indicating what you are sending back, the reason why and what you want done (exchange or refund). Download Order Return Form ». 2) Return the form with the merchandise you want exchanged/refunded any way that is convenient for you. There is an address label on the top of your invoice that is provided for your convenience. Return costs are the responsibility of the customer. Each order also includes an easy to use return label for your convenience. There is a charge of $6.95 for the use of this label, which will be deducted from any credit due on your return or, in the event of an exchange, we will charge your credit card $6.95 for the label. The instructions for the use of this label are found on the back of the label. • You may return the package via UPS or USPS. There is no need to go to the post office or UPS store. You may give the package to your postman or UPS driver or you may drop it in a UPS drop box or USPS mailbox. • Peel off and place the pre-paid return label on the package. If you are using the original shipping bag or box, be sure to place the return label over your name and address on the package and to obliterate any other addresses and barcodes on the outside of the package. How do I exchange items by phone? In a hurry? Don’t have time to wait for an exchange by mail? Give us a call to place an order by phone for the new item. We’ll have your new order on the way in no time. You may then return the original merchandise for a refund. Our trained Account Specialists will gladly answer any questions you might have regarding returns or service. Just call 1-888-772-3160 24 hours a day. Most refunds on returns are in the form of original payment. If you paid by credit card, LASCANA will refund your purchase amount to the same card. If you applied a promotional code to get a discount, discounts will only be applied to exchanges for the same style in another size or color. The discount can’t be transferred when exchanging for a different style. Refunds include any US taxes originally paid on the item being returned. It can take up to two billing cycles for refunds to appear on printed credit card statements, although you should be able to verify the credit within 72 business hours from the date the return is processed. A credit card Refund your purchase amount to that same card. Refunds include any US taxes originally paid on the item being returned. It can take up to two billing cycles for refunds to appear on printed credit card statements, although you should be able to verify the credit within 72 business hours from the date the return is processed. We do not refund duties/taxes from other countries, as we do not collect them. Those would be refunded by the appropriate Customs office in your country. Add items to your shopping cart and go to checkout. At checkout you may select shipping options and payment methods. You may also enter your billing and shipping addresses as well as your email address and phone number. This is where you would also enter any promotional offers or gift card information you may have. You will have an opportunity to review your order and make any necessary changes before submitting the order for processing. After you have submitted your order, you will receive a pop-up confirmation that the order has been submitted. Once it is entered into the system you will receive an email confirmation for your records with the order number and a summary of the order itself. When your order has shipped from our warehouse you will receive a second confirmation. This will include any tracking information you may need (if the shipment method chosen is one that provides such information). For standard shipping to the US, delivery is usually within 5-7 business days. We have agents available 24 hours a day to take orders by phone. Callers in the US may call us toll free at 1-888-772-3160. We do have agents able to assist our Spanish-speaking customers too. Be sure to have the style numbers for the items you wish to order handy, as well as your credit or debit card information. How do I place an order by mail or fax? 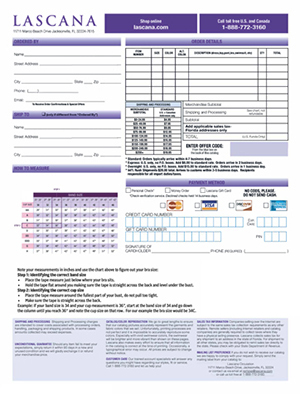 You may use an order form from a catalog, or simply include all the information needed in a brief note or letter. You will need to include style numbers, colors, sizes, your credit card number and all billing and shipping information. If you have a customer number and a catalog source code or a promotional code, please be sure to include these as well. You may pay with check or money order if you prefer. Please note, however, that all checks and money orders are run through a verification process and may sometimes be held for two weeks before the order is released for shipment. If you prefer to send us your order information by mail, click the link below to download a printer friendly order form to your PC. • Standard orders shipping to the U.S. will ship within 1 business day. • Overnight and 2-day Air orders placed by 5pm EST will ship the same day. All shipping timeframes are subject to stock availability and credit card authorization and verification. 2-day Air and Overnight shipping is not available to PO Boxes, APO/FPO addresses, Alaska, Puerto Rico, Guam, and the US Virgin Islands. You may check the status of your order online by clicking on "My Account." Simply sign in using the email address you used when registering and entering your password. If your email address has changed, sign on with the original email address and change it to your new address under Account Info. From there you may update your account information, check your order status and history, create a Wishlist, and change your catalog and email preferences. You may also create a new password there. You may also check your order status or order history by calling 1-888-772-3160 and speaking with one of our Account Specialists . How do I change or update my order? We do our best to process all orders within 24 business hours or less. If you need to make a change to your order please contact us at 1-888-772-3160 and an Account Specialist will be happy to assist you in making any changes, provided your order has not yet shipped. LASCANA is designed with the utmost care to provide you with a perfect fit from size 0 to 24, cups AA to G. Follow the size guide to find your perfect size the first time you order! When ordering by mail, you may also pay by personal check, cashiers' check, or money order. Please do not send cash. All funds must be in US Dollars. Companies selling over the Internet are subject to the same sales tax collection requirements as any other retailers. Remote sellers (including Internet retailers and catalog companies) are generally required to collect taxes where they have a physical selling presence. LASCANA collects sales tax for any shipment to an address in the state of Florida. For shipment to all other states, you may be obligated to remit sales tax directly to the state. Please check with your State Department of Revenue. Why should I create an account at LASCANA? A LASCANA Online Shopping Account is a free service available to all of our customers. It's the ultimate in shopping convenience. It's a way for us to store your information safely and securely, so you don't have to enter your billing and shipping addresses each time you shop. By providing your first and last name. By providing and confirming your e-mail address. By providing and confirming your password. You have the added advantage of being registered in our store's Billing and Shipping system which enables you to rapidly checkout. Click on “My Account” and enter your email address, then click on “Forgot your password.” We will send your password to the email address on file. How do I contact LASCANA? The LASCANA support team is available 24 hours a day, 7 days a week. You also have the option to talk to a Spanish-speaking representatives. We will reply back within one business day.